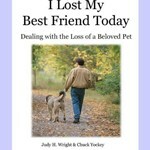 loss of loved ones: people, beloved family pets, things, ideas, jobs, house, friendship, season and so on. 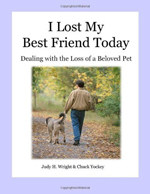 As Pet Partners how do we say Goodbye to a beloved family pet? I Lost My Best Friend Today: Dealing With The Death Of A Beloved Pet. It’s the best selling book I’ve ever written and I’ve written about 23. This is one of the stories that really resonated with readers. It’s an author unknown, but usually that means that it’s someone that’s a likeminded person that we would have enjoyed knowing as a friend. “Being a veterinarian, I had been called to examine a 10-year-old Irish Wolfhound named Belker. The dog’s owners, Ron and his wife Lisa and their little boy Shane, were all very attached to Belker and they were hoping for a miracle. I examined Belker and I found he was dying of cancer. I told the family we couldn’t do anything for Belker and I offered to perform a euthanasia procedure for the old dog in their home. As we made arrangements, Ron and Lisa told me they thought it would be good for the 4-year-old Shane to observe the procedure. They felt as though Shane might learn something from the experience. The next day I felt a familiar catch in my throat as Belker’s family surrounded him. Shane seemed so calm putting the old dog on a blanket and petting her for the last time, and I wondered if he understood what was going on. Within a few minutes Belker slipped peacefully away. The little boy seemed to accept Belker’s transition without any difficulty or confusion. We sat together for awhile after Belker’s death, wondering aloud about the sad fact that animal lives are shorter than human lives. Shane, who had been listening quietly piped up, “Well I know why.” Startled, we all turned to him. What came out of his mouth next stunned me. I had never heard a more comforting explanation. Isn’t that an amazing story? It really teaches us all the value sharing an experience with our family? I have to agree with this family of incorporating the whole tribe there: aunts, uncles, brothers, sisters, anyone who recognizes the depth of love to this animal should be present. It opens a door to respectful communication with all of the caring people on the emotions surrounding this death, and it allows the children to experience exactly how adults handle death and life. As we say goodbye to our beloved family pet, we also say hello to the life lessons learned and wonderful memories. I’ve been a parent educator and a family relation coach for about 25 years and I always recommend telling children the truth as much as possible, all the while being kind and aware of what they need to know at the time. Those children who are allowed to participate in the death and in the ceremonies surrounding it come away with a deeper respect for life and a deeper respect for the adults in their circle. They also grow into caring adults who recognize that all living things deserve respect and dignity in life and death. Please sign up for our community of kind, thoughtful people who have respect for all creatures. We will keep you informed about upcoming classes, books and seminars. You have been drawn to this blog and site because you care. We want to show support and offer resources to assist you in your life as Pet Partners. Be sure and leave a comment or sign up to get notices about our weekly radio show and podcast at www.blogtalkradio.com/auntieartichoke The show features experts in the world of Animal/Human Connection.